I am Disney obsessed and always have been. This is because I took my first ever trip to Disneyland at just 4 years old and fell in love. I've been to Disneyland on 3 separate trips and to Disneyworld just once. I think Disneyland is the most magically place in the world and it feels just so right to go there. 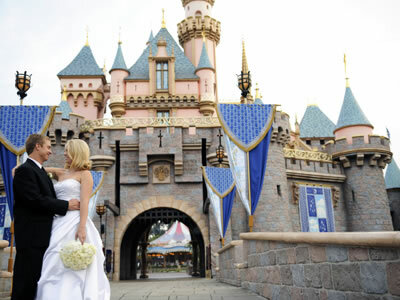 If I had an endless budget (or even just a large one) for my wedding day - I would be booking my Disney Wedding right NOW. But alas, I don't have that budget - so I can just dream! For now my goal is saving enough money to take Jesse to Disneyland for the first time - because then he might understand why I'm so in love with the place! So tell me, if you could get married anywhere in the world - where would you choose? Oh my goodness, Lorraine! That would be wickedly awesome - I can totally see you doing that too!